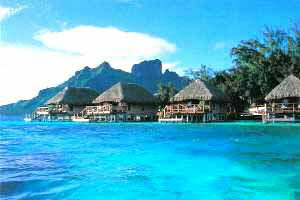 French Polyneisa has been an inspiration to artists, writers and adventurers throughout the ages. It has the power to inspire to this day. Each unique island comprising French Polynesia is truly breathtaking. Exquisite sunsets, endless beaches, majestic palm trees swaying to the tune of South Sea breezes, a place on earth where dreams become reality. The lagoons are perfect for swimming, crystal clear water, shallow (chest deep), calm water protected from the wave by the reef surrounding the lagoons. I flew on board Air Tahiti Nui wide body jet for a short 7 1/2 hours flight from Los Angeles to Papeete, Tahiti to board the beautiful m/s Paul Gauguin for a 7-night cruise of the French Polynesia islands. From Papeete we cruised to Raiatea, private island Tahaa (Motu Mahana), then Bora Bora and Moorea before returning to Papeete for my flight home. m/s Paul Gauguin is one of the highest space-to-guest ratios of any cruise ship, with luxurious, spacious ocean-view staterooms and suites, half with private balconies. A state-of-the-art retractable watersports platform provides direct access to the crystalline waters of the bluest lagoons you'll ever see. Look we have a bar on the beach of Bora Bora Lagoon stock with wine, beer, champange, cocktail, peanut, pineapple and coconuts. This is just a welcome bar for photo, the real bar is larger. 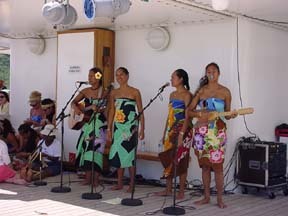 Entertainment on board m/s Paul Gauguin features international performers as well as talented singers and dancers of Polynesia. The Les Gauguines is Tahiti Music Group entertaining us on the pool deck. 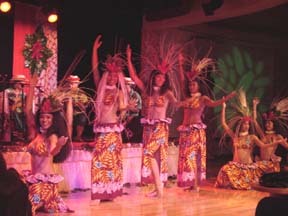 This is not just a hula show, the Tahitian Dancers bring hula to another level with their O' Tahiti'e show. 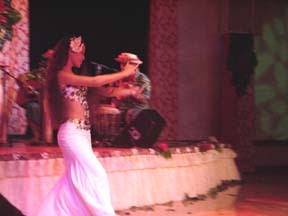 This one was perform right in Le Grand Salon of m/s Paul Gauguin. The intensity is unreal and the excitement is unparallel. The slow hula telling the story of romance. 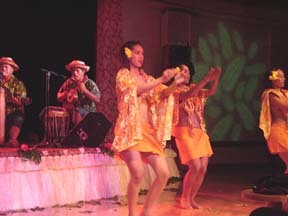 Tahitian Dancers demonstrate pareo (or pareu) can be tied in many different casul and elegant ways and is the ideal daytime wear for vacationers. Pareo can be worn by both men and women. Telling the story of love. 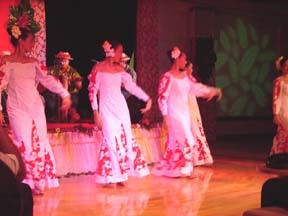 You can also see some of these performance right in your resort if you are not on a cruise. 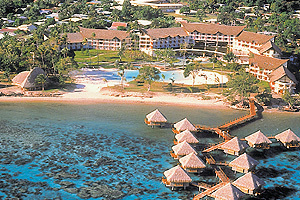 Click the pictures at the bottom of this page to discover some of the fabulous resorts in French Polynesia. Not to be out done, the male dancers put in an exciting performance as well. 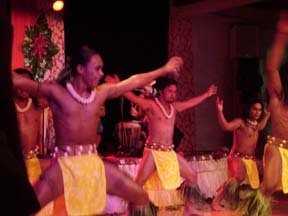 The Tahitian male dancers demonstrate their power to protect their village and their people. 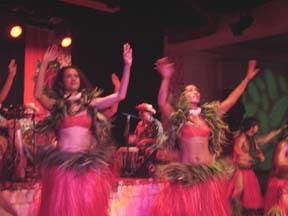 Tahitian Grass Skirt Hula what everybody come to Tahiti to see. 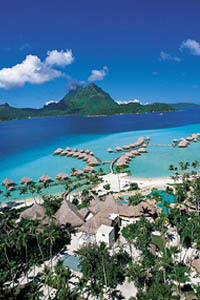 With that we bid fairwell to this wonderful land of love French Polynesia. 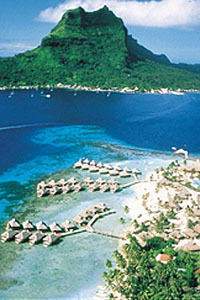 Hope to see you soon in French Polynesia! Vacation Review: As the ship approaches Te Ava Nui Pass, the only entrance to Bora Bora's spectacular lagoon, you will discover right away why this is considered one of the most beautiful places on earth. One look at Mount Otemanu, surrounded by misty clouds and towering over azure waters, and you will forever want to remain a part of this island paradise. For an exhilarating expedition, you can even snorkel among coral formations and watch as local divers feed the small, non-dangerous lagoon sharks. 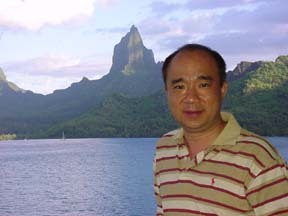 The meals on board m/s Paul Gauguin are exquisite and the service are unparallel. 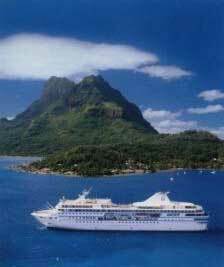 The luxurious m/s Paul Gauguin with a maximum of only 320 guests gives us plenty of unclouded public spaces. Selected wines are offered complimentary during lunch and dinner and complimentary soft drinks and fruit juices are available throughout the cruise. On top of there is no need to dig in the pocket of tips at the end of the cruise, as the basic gratuities are included in the cost of the cruise! This is truly a superb vacation of a life time.